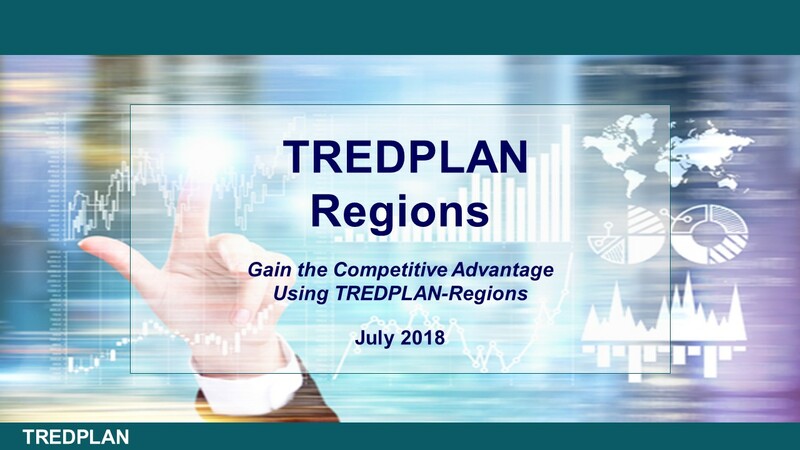 TREDPLAN-Regions is a new and unique system for evaluating and communicating the interrelationship between growth, and freight activity for regional planning using a fusion of data including county level freight data. TREDPLAN-Regions offers a way to put the regional shifts in freight-economy in perspective by offering an intuitive model which links models of freight and the economy together to allow for dynamic forecasting of activity and tracking of inter-industry freight shipments. It allows for the comparison of region(s) based on stratified market segments, by commodity, by mode, and by foreign trading partner and domestic sources. It allows you to assess alternative futures - how spatial, economic, technology, and regulation changes will shift competition and the economic position of individual regions, and finally, be able to benchmark that change against specified, or identified competitors. The key to successful planning is understanding your relative strengths and weaknesses. By using TREDPLAN, you are arming yourself with the right data to better understand future needs. Learn to leverage this platform to drastically enhance existing capabilities.